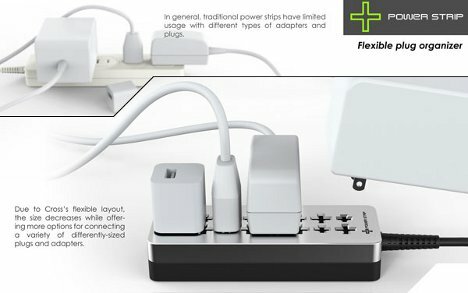 When you plug something into a power strip, it often takes up the spaces on either side of it as well, making it seem like you’re wasting a good part of the power strip’s functionality. 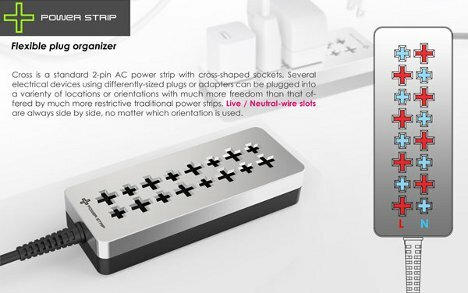 The Cross power strip concept from designer Hung Wang would make it far easier to plug in a variety of plugs or adapters because of its unique cross-shaped slot design. In a two-pin outlet (or power strip), one strip is neutral and the other is live. 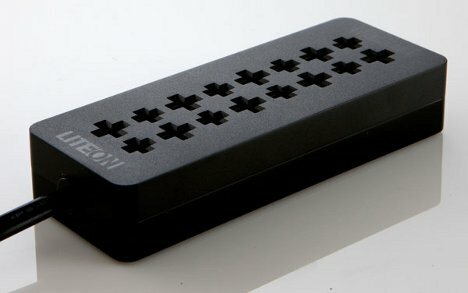 With the Cross’s layout, one plug pin gets the neutral side and one gets the live side, regardless of the direction or location it is being plugged in. The simple but ingenious shift of traditional design allows users to plug in more of their gadgets at once. If a fat adapter is taking up too much space in one direction, rotating it will give a bit more space for other plugs to take up residence nearby. Although only a concept at this time, this is definitely a product that we can imagine people embracing with open arms.